Very interesting Leaded Glass Inverted Dome reminiscent of a Geodesic Dome. Very nice designed Opaline slag glass makes this a good light coupled with the 1494p pendants , as shown in the Ensemble photo, for lighting up the expanse of a Kitchen Island. 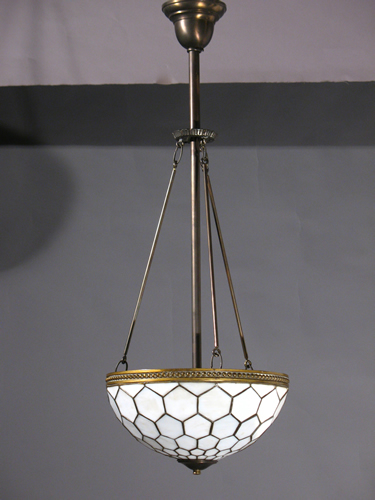 A three light cluster inside with porcelain sockets will provide plenty of illumination.